To download Visual Studio 2013 Update 3, click on the download button. The files are downloaded from our free Dev Essentials subscription-based site. Please see the Dev Essentials page for information on our free comprehensive developer program and services. To get more details on these releases, see the Related Releases section below. Watch the Visual Studio 2013 Update 3 episode of Visual Studio Toolbox with Robert Green and Dmitry Lyalin. Use CodeLens indicators in the editor to learn about your code while staying focused on your work. You can find code references, changes to your code, related Team Foundation Server items, and unit tests – all without looking away from the code. To learn more about CodeLens, see: Get history and other info about your code. For more information, see: Code Lens for Git in Visual Studio 2013 Ultimate Update 3. Code maps help you avoid getting lost in large code bases, unfamiliar code, or legacy code. For example, when you are debugging, you might have to look at code across many files and projects. Code maps help you navigate around these pieces of code and see relationships between them. You don't have to remember all this code, keep track of files, or draw a separate paper diagram. 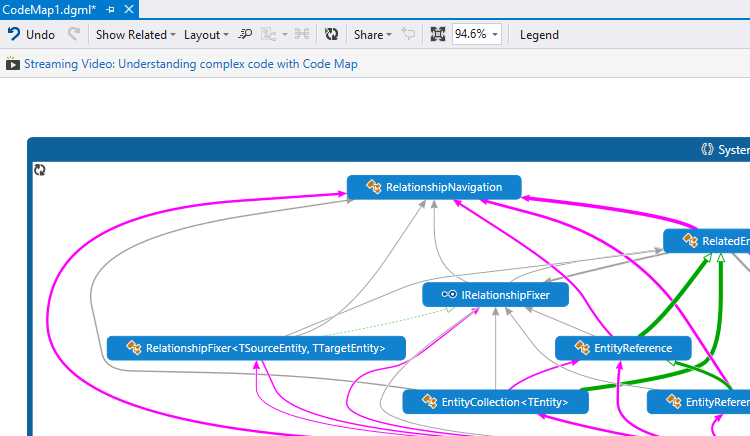 To learn more about code maps, see: Map dependencies in specific code using code maps in Visual Studio. For more information, see: Code Map improvements in Visual Studio 2013 Ultimate Update 3. For more information, see: Multiple Monitor Support for Windows Store Apps in Visual Studio 2013 Update 3. A memory dump is a snapshot of an app's use of memory when the dump is performed. For more information, see: Using Visual Studio 2013 to Diagnose .NET Memory Issues in Production. For more information, see: .NET Memory Analysis: Go to Source in Visual Studio 2013 Update 3. For more information, see: Performance and Diagnostics Hub in Visual Studio 2013. This tool provides data for specific functions that are using the CPU, so you can make decisions about where to focus your optimization efforts to achieve the best performance. For more information, see: New CPU Usage tool in the Performance and Diagnostics hub in Visual Studio 2013. For more information, see: Memory Usage Tool. In Update 3, you can also use this tool with WPF (with .NET 4.0 and above) and Win32 apps. For more information, see: New Memory Usage Tool for WPF and Win32 Applications. Focus on objects that are important by explicitly forcing a garbage collection in your application to get rid of short-lived objects and objects in the Finalizer queue before taking a snapshot. No more copying data row by row. Copy and paste formatted content from multiple rows in any data grid in the heap analysis views using standard gestures like CTRL + Click. Native heap analysis completes faster than ever. We delay load symbols for non-user assemblies until you explicitly turn off Just My Code. We have seen approximately a 10X improvement in load times for large session files. To learn more about performance events, see: Performance Details in IntelliTrace. To learn more about the WACK, see: Using the Windows App Certification Kit. One of the top feature requests from our users across various forums has been the ability to customize test plans and test suites to suit your testing needs. With Update 3 for Team Foundation Server 2013, it is now possible to add custom fields and workflows to test plans and test suites. For example, add an extra field to identify the reviewer for a test plan, or add a field for the test type to know if the test suite is for regression or functional tests. In addition, you can change the default values for the state field to further improve your process. For more information, see: Configure features after a TFS upgrade. Any fields you add or changes you make can then be viewed or edited from Microsoft Test Manager or Team Web Access. Just open the test suite or test plan. For more information on getting started, see: Use test plans and test suites after a TFS 2013.3 upgrade. With Update 3 for Team Foundation Server 2013, test plans and test suites now track change history, like other TFS work items. For example, you can view test cases that are added to a test suite from the All Changes tab in the History section. You can grant this permission to provide a different level of access at the area path level. The existing permission to manage test plans is changing to restrict access to specific test plan properties. 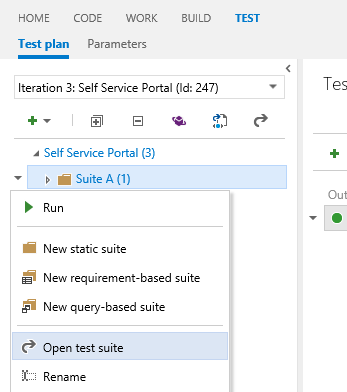 For more information, see: Test Plan and Test Suite Customization with TFS 2013 Update 3. You don't need to use resources and set up your own machines to do load testing on your web site. You can use cloud-based load testing to provide virtual machines that generate the load of many users accessing your web site at the same time. When you run your load tests for your app using Visual Studio Online, you can use Application Insights to retrieve performance data as well. By correlating load and performance data together, you get more insight into any performance issues that you find. With Update 3, you are no longer limited to the default counters. Now you can choose any performance counters from Application Insights that you want to see. Improve the process of managing the release of your app. Deploy your app to a specific environment for each separate stage. Manage the steps in the process with approvals for each step. You can now deploy to an on-premises environment or a Windows Azure environment without having to set up a Microsoft Deployment Agent on each machine. You can use Windows PowerShell, or Windows PowerShell Desired State Configuration (DSC). There is a new action in Release Management to support deployment with either of these. You can now use the change summary to see the user stories and bugs completed since the previous release to know what to test and put in your release notes. ASP.NET and Visual Studio gives developers a powerful set of frameworks and tools to build websites, services (API's), real-time bi-directional communication endpoints and much more. You can learn more on the official ASP.NET website. We updated both ASP.NET Web Platform and Tooling with Update 3 (highlights are listed below). For a complete list of changes please see: Announcing New Web Features in Visual Studio 2013 Update 3 RTM. Visual Studio Web tools provide everything web developers need to create great apps, including project templates, special editors for HTML, CSS and JSON file types, and IntelliSense. For more information, see Announcing New Web Features in Visual Studio 2013 Update 3 RTM. ASP.NET Scaffolding is a code generation framework for ASP.NET Web applications, it helps developers save time for common tasks such as adding code that interacts with data models with just a few clicks. To learn more about Scaffolding, see: ASP.NET Scaffolding in Visual Studio 2013. With Update 3, we added proper support for ASP.NET MVC and Web API packages v5.2 that did not work as intended in Update 2. The JSON editor enables developers to work with JSON files using the rich code editor in Visual Studio, with capabilities such as colorization, syntax validation and more. In Update 3 we added options to give users more control over the editor, including the ability to turn off auto-formatting. To learn more about the JSON editor see: New JSON Editor Features in Visual Studio 2013 Update 2 CTP2. The CSS editor enables developers to work with CSS files in Visual Studio. In Update 3 we enhanced the CSS editor to enable developers to drag font, image or CSS files from their solution explorer and drop them right into the CSS file, which will auto-generate the correct CSS tag and file path. We also enhanced IntelliSense support for Selectors Level 4 that supports more selector patterns and makes it easier for developers to implement them in their markup. To learn more about the CSS editor, see Visual Studio 2013 Web Editor Features - CSS. Added support for two-factor authentication in One ASP.NET templates (for both MVC and Web Forms). You can learn more by reading: Two-factor authentication using SMS and email with ASP.NET Identity. The ASP.NET Facebook Template has been moved out of the File > New > Project dialog and into the NuGet gallery where it is now hosted (see: Microsoft.AspNet.Facebook). This allows Microsoft to make rapid changes to this template as Facebook's APIs change. Update 3 provides added support for SignInManager, which makes it easier to add two-factor authentication, account lockout, and other security features when you log on. For more information about this feature, see ASP.NET Identity 2.1.0-alpha1. This update includes Entity Framework 6.1.1. For more information, see EF 6.1.1 RTM Available. With Update 3, WebDeploy allows integration with SQL Server 2014. For more information, see WebDeploy 3.5 RTW. Windows Azure Notification Hubs allow you to send mobile push notifications from any backend to any mobile platform. The Notification hub now displays a list of devices that are registered to receive notifications. The hub also allows you to edit the registrations and delete the devices. For more information, see: Notification Hubs (Azure Documentation). With Update 3, you can now add standard console projects to your Visual Studio solutions and publish them to Azure Websites as either continuous, triggered, or scheduled WebJobs. In addition, console projects can be published directly from the Solution Explorer as WebJobs to Azure Websites. You can now provision a mobile service in the New Project dialog, instead of adding the service after you create the project. In Update 3 RTM, you launch the Visual Studio Graphics Analyzer IDE when you analyze the frames you just captured in the current diagnostics session, or when you open an existing .vsglog from disk. This gives you a dedicated space for inspecting graphics information without overlapping with your regular Visual Studio windows. Capture in compatibility mode. In compatibility mode, apps do not use hardware-specific capabilities, so that capture can be played back on different GPUs. In Update 3 RTM, you can edit shader code and immediately apply the changes to the .vsglog file, so you can see the impact of your changes without having to re-run the app. You can open any shader files in the shader editor window by clicking on the shader file name in the Pixel History window or the Pipeline Stages window. For more information about Graphics Diagnostics updates, see Graphics Diagnostics in Visual Studio 2013 Update 3 RC. Application Insights is in preview for Update 3. Find out what users are doing with your app, so that you can focus your development work where it's most useful. Make sure your web service is available and responsive. Quickly diagnose any performance issues or exceptions in your web service. When people download and use your app, you will see statistical data in the Application Insights portal. Before this update, .NET Framework 4.5 had to be present on the client machine whenever a SHA-256 code-signing certificate was used for desktop applications published with ClickOnce or Visual Studio Tools for Office add-ins. If you have used SHA-256 code-signing certificates in the past, and have seen errors like "The application is improperly formatted", "The manifest may not be valid", "Manifest XML signature is not valid", or "SignatureDescription could not be created for the signature algorithm supplied". For more information, see Update on Autohosted Apps Preview program. For a complete description of technology improvements, bug fixes and known issues in this release see the KB article Description of Visual Studio 2013 Update 3 RTM. You can download the release here: Multi-Device Hybrid Apps (Preview). To learn more, see: Apache Cordova Tooling Update with Support for Windows 7. The Azure SDK 2.4 RTM release includes tools to manage virtual machine configuration and set up remote debugging for 32-bit applications running on virtual machines, and tools to provision Geo-Redundant Storage. In this release, Server Explorer now has a Configure option on the context menu for virtual machines. You can use this to view and edit properties of the virtual machine, set up endpoints, add and configure extensions, and create virtual machine snapshots. You can also set up remote debugging for 32-bit virtual machines from the same context menu. Read-Access Geo-Redundant Storage (RA-GRS) gives you better read availability for your storage account by providing read-only access to the data that has been replicated to the secondary location. You can now select RA-GRS as a redundancy option when you create a storage account from Visual Studio. For more information about this release, see: Azure SDK for .NET 2.4 Release Notes (MSDN). The standalone IntelliTrace collector provides a more practical alternative to remote debugging an application in production. You can use the collector to record the execution of your application on a remote machine by saving it into an .itrace file and playing it back on your local development machine with Visual Studio. For more information about the collector, see Collect IntelliTrace Data Outside Visual Studio with the Standalone Collector. You can download the RTM release of the IntelliTrace Standalone Collector here: IntelliTrace Collector for Visual Studio Update 3. The new emulator package is now available to be downloaded from the Windows Phone 8.1 Update Emulators.